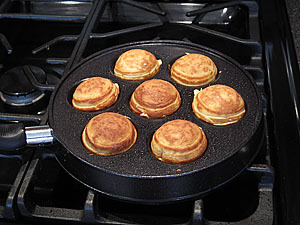 What is a Cinnamon-Bun Ebelskiver? It’s basically a cinnamon roll and a pancake rolled into one! 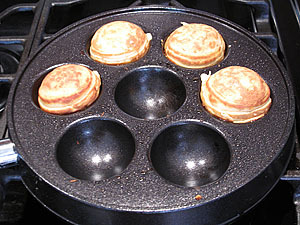 We received the Williams-Sonoma ebelskiver pan as a gift a few years back. Last weekend we whipped it out and made breakfast for the family before we went to cut down Christmas trees. Mike and I have made nutella, boysenberry and peanut butter filled ebelskivers in the past but these were by far the best. 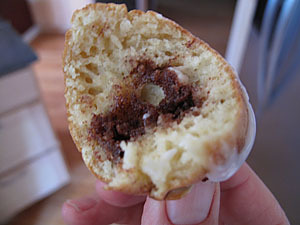 Each bite oozed cinnamon sugary goodness (don’t go light on the filling). The drizzle of cream cheese frosting was awesome. It was light, airy and melted in your mouth. Tasty Tip: For the first time we tried the new WS ebelskiver mix. It worked well but don’t trust the quantity it says it makes. We made a batch and a half which was supposed to produce ~36 but it only made 23. Also, it’s just as much work as making from scratch… you just skip the measuring of the dry ingredients. Hi Nicole! Those look fantastic! In case you didn;t know: ‘Æbleskiver’ is Danish for ‘apple slices’, even though today they are usually not made with apples or apple sauce. In Denmark they are traditionally made on Dec. 23, the day before Christmas Eve, which is the most important day of the Christmas holiday. Oh that reads weird now. Christmas Eve is the most important day, obviously. I didn’t know that. We will have to try these with apples. Maybe apples with cinnamon like an apple pie! Thank-you for the recipe!! I live just outside of Mpls the home of NordicWare, their factory smokestack is a landmark I remember from my childhood. 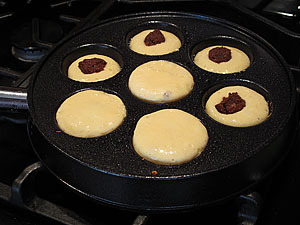 Today I went to their factory store for the first time, I purchased an ebelskiver pan for under $30. I am looking forward to preparing your recipe Christmas morning. And many more trips to the NordicWare outlet. Just got the same pan from Williams-Sonoma and am excited to give it a try. A common complaint is that you can’t make many at a time, making it hard to feed a family. I have found that when making pancakes, I like to keep the done ones on a plate in the oven to keep them warm until they are all done. Thanks a lot! That was really helpful, I just Dugg your website. I filled them with chopped apples fried in butter with cinnamon and sugar. My family was beside themselves in food induced glee! thanks for the idea of putting the Cream Cheese icing on them. Perfect final touch! Sounds good Chris! May be something I make for the 4th! 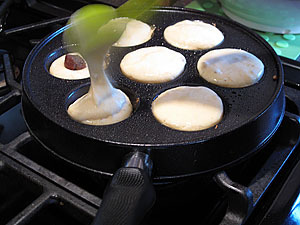 I *knew* I’d find some delicious recipes to use with my new ebelskiver pan!! My parents came to babysit our kids while DH and I went on vacation for a week…we have a Williams-Sonoma here and they don’t have one where they live. Anyway, we ended up with one of these. 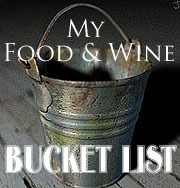 The puffs we made filled with strawberry jam were delicious, but I am definitely going to try this recipe, too!! And because I’m a big Alton Brown fan and subscribe to the “no uni-taskers in the kitchen” rule, I’m also thinking this would make delicious cornbread fritters, cupcake puffs and maybe even some really good over-easy eggs! I bought the mix and it is a little bit of a ripoff–not much in it, not much flavor. How would you make the mix from scratch/ ingredients? Thanks. Robert- if you click on the recipe link above it lists the ingredients for the pancake mix. I scoured the web looking for a great ebelskiver recipe to try for the first time… This turned out really fantastic, and much simpler than I had expected. 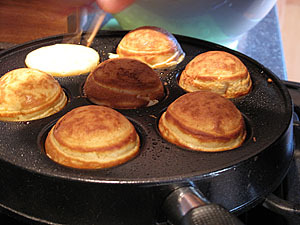 I haven’t been able to find an ebelskiver recipe here in Singapore, and had to use a Vietnamese round pancake pan instead. Did the trick, but a bit challenging. Will have to get someone to pick me up the Williams-Sonoma pan from the US!